Participants in my workshops confirm it every time I ask. The most common way professionals start preparing their presentation is to copy slides from previous files. The presenter picks all the slides they think might be useful in this presentation. This is a big mistake that causes many presentations to be not nearly as effective as they could be. Why? Because when you start by copying previous slides, you have the steps you should be following in reverse order. You copy those slides into a new file, and then hope you can arrange them, and a few new slides, into some coherent message. This rarely works well. You end up with a message that does not flow, leaving the audience confused and the important message you needed to communicate goes unheard. What should you do instead? Think like a GPS unit. You've probably used a GPS, either one that is built-in to a vehicle, a handheld unit, or one on your smartphone. I think a GPS unit is a great analogy for how you should approach planning your presentation. That's why I share this analogy with the participants in my workshops. When you use a GPS, what is the first thing you need to do? You need to tell it where you are going. Not a generic destination, like the name of a town, but a specific address you want to go to. You need to include the street number, street name, street direction if necessary, town or city name, and state or province perhaps. The GPS unit needs you to be very specific about where you want to end up. It is the same when planning our presentation. You need to be very specific about where you want the audience to end up at the conclusion of your presentation. Do you want them to approve a proposed course of action? Do you want them to use some new process in their daily work? Do you want them to agree to support a new initiative? Do you want them to understand a concern in last month's financial results? 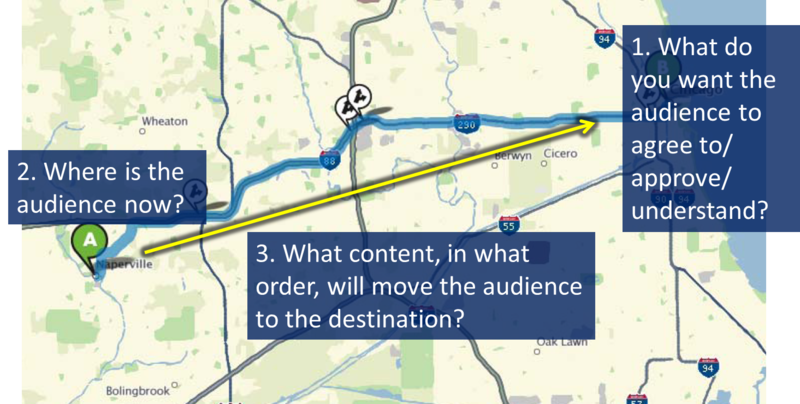 Without a specific destination, you won't know how to plan the content in your presentation to get the audience to that destination. The next thing the GPS unit does is to search for the satellites that help determine where you currently are. This is usually a blue dot on the GPS screen. In our presentations, we need to determine where the audience is right now. Look at the roles of the people who will be attending. What current level of knowledge do they have on this topic? What are their concerns or objections? How much do they trust you, your firm, and your analysis approach? What format do they prefer for presentations? Look at all aspects of each audience to determine where they are now. Once the GPS knows where you are and where you want to go, it can determine the best way to get you to your destination. It is the same with your presentation. It is only after stating a specific goal and doing the audience analysis that you are ready to determine what content is required, and in what order, to move your audience from where they are to where you want them to be at the end of the presentation. Once you have determined the required content, you can then see if any existing slides from previous presentations can be re-used. Starting by copying slides is approaching your presentation in the reverse order. It results in a confusing presentation and a lower chance that you will be successful with the presentation. Take a few minutes to plan your presentation using the GPS analogy, and you will end up with a better presentation. This is such a powerful approach that I have explained it in more detail in my book GPS for Presentations.